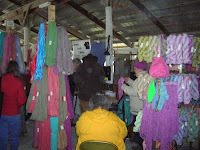 This past Saturday I traveled to Greencastle to attend The Fiber Event. 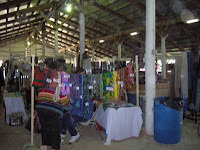 This was my first fiber festival of any kind and it was exciting! 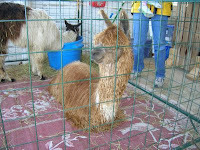 I also saw some alpaca (oh so cute!). The lady even let me hold FR (Fraggle Rock). She was so soft and cuddly! 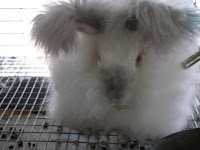 Don't tell my bun, or the SO, I briefly thought about getting another bunny! After walking through the 3 "buildings" of vendors two times, I felt a little more relaxed. I'm telling you, I was really overwhelmed by all of the stuff I saw! If I were a spinner (hopefully I never pick up that craft as I have enough stuff to keep me busy), I would have loved the Greencastle Fiber Event. There was so much roving! Luckily, I don't spin, therefore I could spend all of my time drooling over all of the yarn. After much debate, and walking back and forth from booth to booth (yeah, the SO loved all of this) I decided on a couple of nice skeins. First I found this bit of lovely. 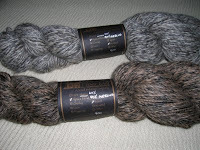 It is a skein from Maple Creek Farm, an indy spinner and dyer from Telford, PA. 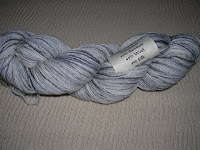 I picked up a bamboo, wool, silk blend, hand dyed in a colorway named Iron Kettle. Pretty! Bettie Lace Stockings - Oh MY!